Unalloyed steels are prone to cold cracking. In many cases preheating is required to ensure good weldability. Low alloy steels are prone to cold cracking. In many cases preheating is required to ensure good weldability. Fine-grained steels are prone to cold cracking due to hydrogen absorption. They should be preheated slightly and welded with a relatively low specific energy, to reduce the heat-affected zone. 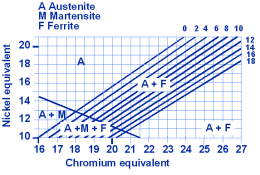 Austenitic manganese steels with a manganese content of 14% (Hadfield steels) have a tendency to form brittle precipitates in the form of carbides. It is essential to weld them without preheating, even with additional cooling, and to keep the specific heat input low. 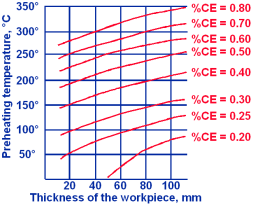 Postweld treatment: Slow cooling to 120°C (martensitic transformation) and annealing at 750°C or hardening (generally 1000°C/oil) and tempering (generally 750°C). Watch for formation of chromium carbide between 500°C and 650°C!